the difference in everyday use between these two optuons? Between the two proposed emitter options, you mean? yes, this is what i meant. The 3000K, 95+ CRI, variant of the Luminus SST-20 is an interesting emitter. Waiting is half the fun! Can’t wait for both my units. Everyone is doing a great job! Hum, despite it seems pretty awesome (beam and “colour”) I guess it would be too much on the “yellow/orange side”! Personal preference statement, note! EDIT: BTW, are there any more news on the FW3A ?? Last time I graphed raw poll results, this is how things turned out. The only tint less popular than 3000K was 6500K. 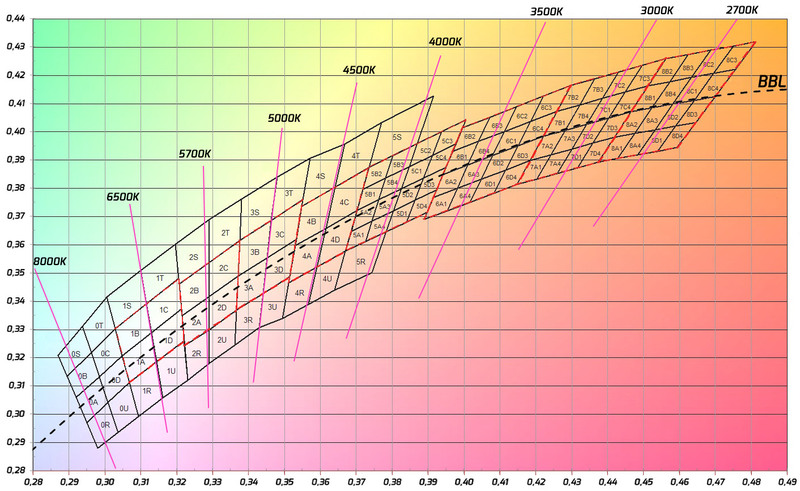 Due to the 2 types of leds in discussion, I also thought the “extreme” values (3000K and 6500K) would be the less favourite, and this table confirms it! Too warm or too cold in a flashlight like this would be not a wise move. Hence the general preferences for the 4000K-5500K! However, seeing djozz’s test, that LED is a nice thing to use in other lights! 1) it measures extreme high CRI with both high R9 and R12, right on top of the BBL in a reflector light. Awesome! 2) it looks kind of boring, the tint and colours it shows are virtually identical to an oldschool halogen bulb that we were all used to. No news today. There is two sides on this led: 1) it measures extreme high CRI with both high R9 and R12, right on top of the BBL in a reflector light. Awesome! 2) it looks kind of boring, the tint and colours it shows are virtually identical to an oldschool halogen bulb that we were all used to. No news today. Even so, it could be used in small lanterns or with diffusers But, still, it is too much “yellow/orange” for me! Please put me down for one light. Of course it’s all personal preference, but I’m with you MascaratumB; the warm “yellow/orange” tints I hate. And the ‘harsh blue’ tints of cold are just as bad in an EDC light…. to me. I’m good with about 4500K – 5750K… but my overwhelming preference being 5000K – 5750K. To me that is much more of a ‘True Neutral White’. Not a lot of tint either warm or cold. I’m one of those weird people that likes the warmer tints. They look really nice outside in my opinion. I like the Yuji 3200k and the XPL HI 7A, for example. I’d have liked the 3500k Samsung emitter for this, but 4000k is a nice compromise and from what I’ve seen online should have a really nice tint. That said, I used to carry an original Olight S1 and liked it despite the cool tint. I think for EDC size, durability, and UI are a bit more important than tint. I have to agree. All of my house lights are 2700K – 3000K LEDs. I love a good warm light. The only thing I don’t like is when they have a green tint. @eas: Thanks for the heads up- I noticed KaiDomain has a P60 dropin with that emitter. I might grab one for fun. I like cool and I like warm. Different tints are nice, to change up now and then, but no green. That said, if I had to choose, the closest to daylight neutral white seems to be the nicest go to. That being said, daylight color temp is nice for finding things; it’s just not for general lighting! Hi. In for 2 or 3. Might go up to 4 if there’s a volume discount! Discovered this project from Eric Pare’s Light Painting FB page. Someone posted a link and if you’re reading this, I want to thank you! I’m at #1432 and would like to add one more. That was me who posted the link from Eric Pare’s FB group. No need to publish your email. Communication will most likely be via private message within BLF when it is time to purchase. Sorry, you say you have one like that? Are you referring to the FW3A or other flashlight or thing? Post #1 is not updated! TK, any possibility to do that so that it keeps being updated ? Sorry, you say you have one like that? . hanoilighting208 is not on the list. that says: Put me down for 1.
hanoilighting208 is from Viet Nam.